Consumer spending on DVDs fell last year, despite more being sold than ever, according to a report. Findings in trade journal Screen Digest suggest average European DVD consumer prices fell by more than 11% in 2005 to just under 15 euros (£10). Price reductions meant spending fell by 1.7%, even though 732m discs were sold last year - more than ever before. Paul Callaghan, Screen Digest analyst, said VHS cassettes were likely to die out completely in Europe by 2008. 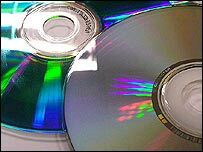 The analyst - one of the authors of the report - said this trend would end up "leaving the way open for further DVD growth - albeit at a slower rate than before". Overall, spending on rentals in the format are thought to have reached about 2.2bn Euros (£1.5bn). In a bid to monitor the effect of cheap DVDs on sale in news kiosks in some parts of Europe, researchers included an estimate of the volume and value of this sector in Italy, France and Spain. The report, entitled European Video - Market Assessment and Forecast to 2009, found that 60% of Western European homes owned a DVD player/recorder. However, there is more room for growth in Central and Eastern Europe, with just 12% of TV households owning a player. The report covered 22 European countries in detail. And its findings suggest that, despite growth in other parts of the continent, the majority of spending on DVDs occurred in the more affluent countries in western Europe. Three-quarters of DVD consumer spending took place in the continent's five largest video markets - UK, France, Germany, Italy and Spain. Spending growth was up in the US and Japan, with the US market up by 2.2% and the Japanese by 4.4%.